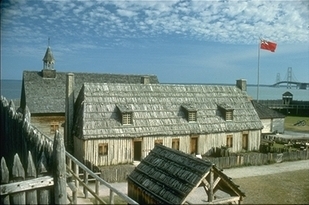 Michimilimackinac, now one of the longest on-going archeological projects of its kind, was founded in 1715 as a French fur-trading village and military outpost. It was here where fur traders and Indians rendezvoused, French and British officers organized war parties and explorers began their journeys into the vast western unknown. It was later occupied by the British who abandoned it in 1780 to establish a new fort on Mackinac Island. Every day is kid's day! Kids can immerse themselves in special children's programs like marching in uniform, participating in games, and washing laundry with a washboard and tub. Lift a fur bale, stand on a giant ground map of the Great Lakes fur trading routes, and zoom down a slide in the Kids' Rendezvous Interpretive Playground. Be a voyageur in a reenactment. Witness an ongoing archaeological dig. With 13 authentically reconstructed buildings, interactive displays, and demonstrations such as open hearth cooking, Native American crafts, and cannon and rifle firings, the entire family--and especially kids-- will be engaged. May 3 to June 11 - 9:00 a.m. to 4:00 p.m June 12 to August 21- 9:30 a.m. to 6:00 p.m. August 22 to October 10 - 9:30 a.m. to 4:00 p.m. This page last updated on 8/20/2014.